"What a fun, quick read!" that helps you finally get started! A primer for adults who want to get back into cycling! To encourage adults to take up cycling again and to help them get started. My book is not for the ‘put your head down and ride like the wind while only seeing the pavement and tire in front of you’ rider. Starting out, buying the bike, equipment, where to ride, the rules of the road, more comfortable riding, and riding more seriously. 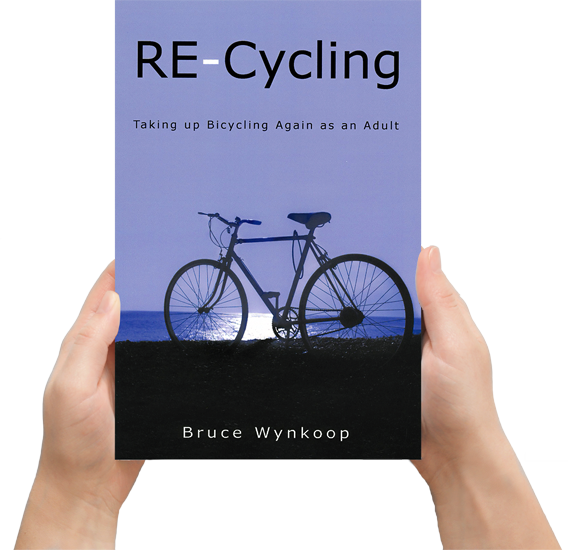 He gives common sense suggestions for safer, more enjoyable cycling and answers questions he has been asked over the years by adults interested in taking up bicycling again. Bruce shares the detailed and fun accounts of his bicycle adventures. Nothing says it like pictures, so enjoy Bruce’s trip photos! Bruce is available to give two PowerPoint presentations about bicycling. Please join us in our vision to make “Minnesota a state where bicycling is a safe, easy, fun and cool choice for everyone.” We believe that more people bicycling more often will benefit the health of individuals, communities, the environment and our economy. The U.S. Bicycle Route System is a developing national network of bicycle routes, which will link urban, suburban, and rural areas using a variety of appropriate cycling facilities. The City of Minneapolis Bicycle Program staff produces the Minneapolis Bicycle Map. Rails-to-Trails Conservancy (RTC) is a nonprofit organization dedicated to creating a nationwide network of trails from former rail lines.